I went to the dentist for the first time in almost five years this week~ no cavities! I celebrated the fact that we didn't have to pay for fillings by buying a super expensive box of professional whitening strips. I blame the dentist. He put that box right at eye level so I had to stare at it through the whole cleaning. I've told you before I'm not allowed to watch the home shopping network either because if I stare at something long enough I will buy it. The good news is I'm going to have a smile like Barbie when I'm done. The box said so. One time, when I was in fifth grade, a girl in my class moved away. Everyone felt sad for her, so we made a card and the whole class signed it with encouraging messages. As her "best friend" I volunteered to mail her the card; however, I had no idea what her new address was or how to accomplish such a task. So I just kept the letter and never told anyone. I still have it. I've tried looking for her on Facebook a couple times because you know, better late than never. I refereed a fight this week that involved someone getting hit in the "weiner" and someone else sitting on their brother until he wet his pants. Aren't you jealous? You remember these cute little jars I made a few weeks ago for our anniversary? I envisioned my husband proudly displaying them on his desk, eating them slowly and thinking of me with a fond little smile on his face whenever someone commented on them. His co-workers made sure to tell me how much they enjoyed the snacks Jarrod left in the breakroom for everyone. They even washed the jars, with the paper labels, for me. Wasn't that thoughtful? My oldest son has robotics class every Thursday right after school. I remember this fact every Thursday just as I pull into the school parking lot with three kids I hauled out of naps to race across town to pick up their brother. I'm pretty sure this next week will be the week I remember. It's just gotta be. I'm considering boycotting any blogs that mention the word spring, humidity, sun, or flowers until there is no longer snow in my backyard. I was late getting this post up because I got home at 11:30 last night from a *gasp* girl's night out, and my husband was waiting for me.... not for that, sheesh. He had the remote in hand, ready to watch the Vampire Diaries. Yeah, we party like rockstars around here. I loved reading all your 'fess ups in the comments last week~ they make me feel normal ;) If you want to link up with me, I'd love to have you. 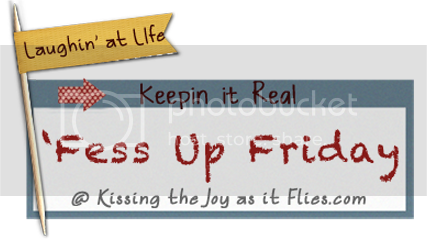 It doesn't even have to be just on Friday~ I will leave the linky party open all week. Happy Friday! I would love love love it if you would share your Fess Ups at my Reality Check After and Before Party! I realize yours is a link party too, I don't want to infringe, I just love your Fess Ups! The linky wont work for me. :-( Sad day! Thanks for sharing Kira! I love hearing about your week. And I campletely empathize about the dentist... Wedding is in 50 days and I still haven't been for a cleaning in 5 years. Eek. You crack me up! I seriously am laughing out loud as I read them. My 5 year old son Jack was praying before dinner the other night (we had gone to the dentist that morning, and it was his little brother's first time). Jack's prayer was "God, thank you for this yummy food that Mommy made. And thank you for this great day. And thank you that Ethan was a brave boy at the dentist, and OH GOD, ETHAN HAS 20 TEETH, isn't that cool?" Amen. I love how honest their prayers are! Girl! You never fail to crack me up! I'm sorry you guys are still getting snow - we'd kill for some of that stuff right about now. We've got horrible fires to the west of us that's wreaking havoc on the land, residents and anyone with allergies. Congrats on the no cavities!! You must have super-teeth - I don't know anyone who has gone that long between visits without cavities. Better late then never for my 1st time Fess up. My 2 year old wet her pants at the zoo. I cleaned her up in the bathroom and rinsed out her underwear in the sink. I then proceed to have her walk around the zoo with wet underwear and a sweatshirt tied around her waist because it was such a nice day. "Mommy, can you turn on music for my baby to fall asleep. She likes Dave Ramsey." I might be over doing it. I ate a whole bag of Easter candy that was supposed to go in the girls’ Easter baskets. And I won't mention anything else about our weather but you are welcome to come visit me anytime in San Diego. @Autumn ~ She likes Dave Ramsey *snort* Heheeee, that is awesome! See, I'm so glad to know that even clean and organized people do stuff like this too!. San Diego, oh man, don't even get me started. I'm on day three of pouring rain here in lovely Ideaho. My grass better be freaking neon green when it lets up.